Finding myself near Hook Norton the other day, and recalling that my most memorable trip there involved a visit to the brewery, I decided to stop in the village and see what I’d missed the first time round. A pair of tall windows, partly hidden by trees, caught my eye. Looking closer, I found that the windows belonged to a Baptist chapel with a long history. Beware of date stones. The one on the front of the Hook Norton chapel bears the date 1718. But the history of Baptist worship in Hook Norton goes back to the 1640s when, according to the chapel’s own website, the first pastor, James Wilmot, was imprisoned for preaching. The significance of the 1718 date is that this was when the Baptists acquired this plot of land, with room for both chapel and graveyard. However they rebuilt the chapel in 1787, which is the date of the present structure with its walls of local toffee-coloured stone and its high windows with beautiful curving glazing bars. There were further alterations in the Victorian period, when a gallery supported on cast-iron columns, still visible through the windows, was installed, to increase the seating capacity. 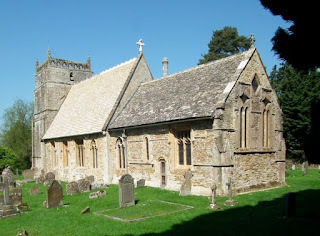 Hook Norton is a fair-sized village, but no doubt people also came to the chapel from surrounding villages in the area between Banbury and Chipping Norton. They found a simple, solid building, in a setting that feels peaceful because the chapel is sited well back from the road. It’s an atmosphere of quiet and seclusion that people must still appreciate today. Perhaps it should be one of the rules for the architectural traveller. As well as ‘Look up’, ‘Walk along alleys’, and ‘Go around the back’, the axiom ‘Look over walls’ has a place in the inquisitive traveller’s rule book. 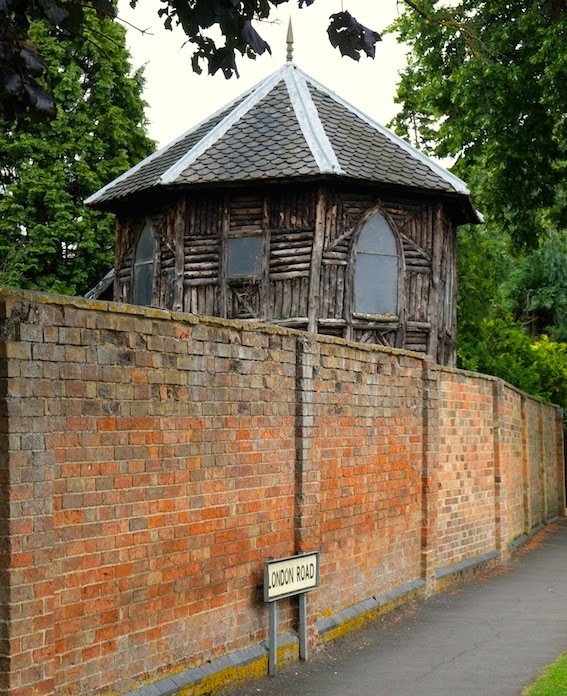 I am often to be seen looking over walls, in search of unusual outbuildings, garden structures, and other buildings likewise hidden from immediate view. Here’s an example from Shipston-on-Stour, the upper half of which, at least, is freely visible above a brick garden wall. It seems to be an octagonal wooden gazebo or summer house, with Gothic style pointed windows and walls made up of short logs arranged in geometric patterns. There’s a lovely fish-scale roof, too. I don’t know how old this building is. Self-consciously rustic garden buildings go back at least to the 18th century, and they owe their form to various sources, from writers’ ideas about the earliest building of all (the ‘primal hut’) to hermitages, or people’s ideas about what a hermitage should be like. In a setting of trees, a brick wall and passing pedestrians, inquisitive or not, this wooden wonder enlivens the streetscape – and brightened up a dull day as I passed. Admiring the King’s Arms in the middle of the Northamptonshire village of Farthingstone (my photograph is taken from the churchyard across the road) I naturally wondered how old it is. The gables, dripstones, and flattened entrance arch all give it a Tudor or Jacobean appearance. Those distinctive lattice windows, though, look like a later addition, from the first half of the 19th century, perhaps. There’s a window at the side, shown in my second photograph that also has an early-19th century look, with Gothic Y-tracery glazing bars. The facts are rather different. 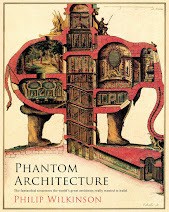 The building is actually a 19th-century neo-Tudor design, albeit done by masons working in a tradition that could still turn out Tudor-looking buildings in the vernacular without necessarily reviving the earlier style in a self-conscious way. They were conscious enough of their worth, though, to leave an initial H, for their surname, Hurley, on the middle gable. The carving protruding form the right-hand gable may be something reused from an earlier building. The windows, by the way, are neither sash nor casement. They have clever pivoting sections, as you can see on the ‘Gothic’ example in my second photograph. 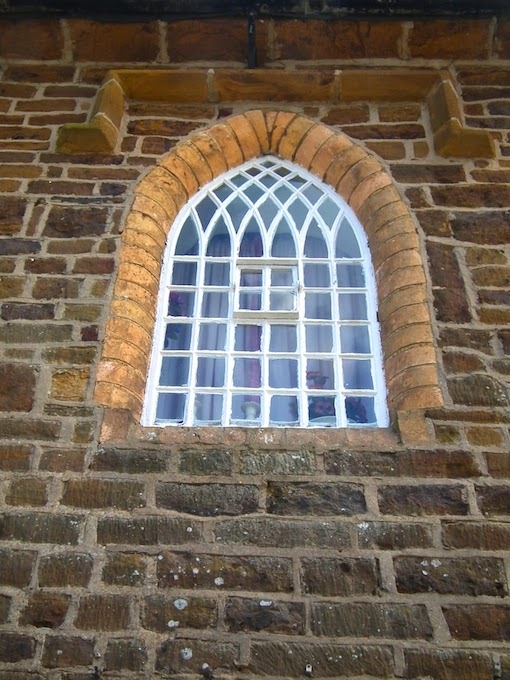 The windows with diamond-shaped panes have diamond-shaped pivoting sections. It is as if the industrial age, in the shape of metal-frames and ingenious hinges (and indeed the rather hard-looking pale bricks that surround the ‘Gothic’ window) has added its contribution to this amalgam of Tudor and Victorian design. An interesting mix. I’m always on the look-out for interesting shop fronts, not least because everyone else seems to ignore them. This lettering is found on the lovely late-19th century frontage of a jeweller’s on Tewkesbury High Street. 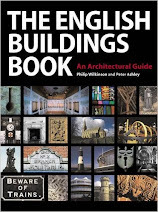 Pevsner (excellent on the timber-framed buildings and much else on this street) does not include it. But it caught my eye for the signs alone, and I was still more impressed when I realised that this front retains the grooves to take its old wooden shutters, which are still put up at night to cover the windows. With an eye on history and style, the shop, now Buttwell and Jones, has kept the old ‘Buttwell & Sons’ signage. The gilded lettering on its green glass background (more beautiful if anything for being worn) has satisfying, full-looped letters with lots of character. Plenty of variation between the width of the strokes, neat loops on the w and o, and a distinctive small s at the end all contribute to the effect. Only the ampersand seems a bit squashed and mean. Up above, against a gold background glinting like an engine-turned cigarette case, are the ornate capital letters of the word ‘JEWELLER’. These letters are a feast of knobbly serifs, curving strokes, and dots. You’d not want too much of this, but, placed where it is, it gives just the right impression of fancy work that the original proprietor no doubt wanted to convey, back at the turn of the 20th century. How pleasing that the sign, and the business it advertises, is still there.